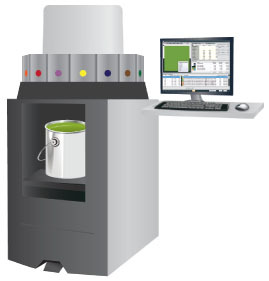 Colibri® ColorTint is designed to control the dispensing of color products on tinting machines. Whether you are handling a new order or a repeat, correcting a color or completing an order, ColorTint helps you to produce the quality your customer expects on every occasion, saving you time and money. Using Colibri® ColorTint together with ColorQuality and ColorMatch will help you manage the full color production process, improving customer service and satisfaction levels.